AWNY members gathered bright and early (for a Sunday!) 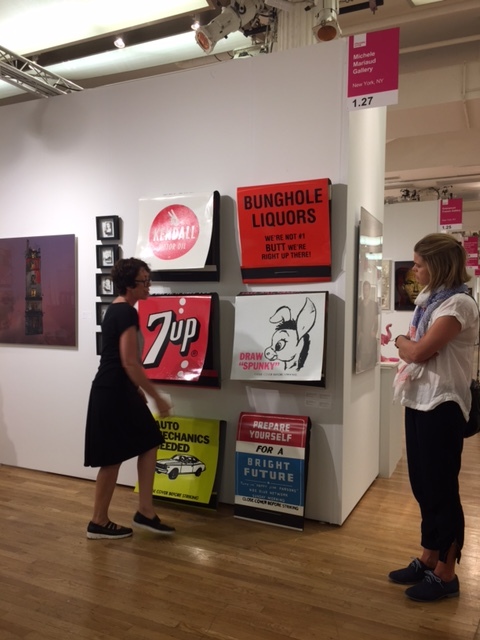 to join our private tour of the Affordable Art Fair on West 18th Street. We were welcomed by the Fair Director, Cristina Salmastrelli, who explained the fair was designed to be an intimidation-free event: people could come and talk to the dealers and artists, ask questions about the pieces in a welcoming and casual setting, and see exactly what each piece was being sold for (this varied from a few hundred dollars to several thousand). Caitlin led us around the two-story space, stopping at several points to discuss the artists that she felt captured the spirit of the event. There were some distinct and compelling works for sale, including a piece by Aurora Dobson that was made entirely of recycled plastic rubbish, and a 6-series piece of giant match books (now on display at the Muriel Guepin gallery in The Bowery). As ‘art legs’ only last for about 60 minutes, our tour ended with wine, coffee, and snacks in the private lounge. This gave AWNY members and friends a great opportunity to catch up, relax, and chat about each other’s favorite pieces.